When it comes to the world of classical ballet, Natalia Osipova is perhaps one of the most recognisable names and critically acclaimed dancers of her generation. Hailed as a peerless talent and a perfectionist of her craft, her glittering ballet career began with the Bolshoi Ballet at just 18 years old, before becoming a guest artist with American Ballet Theatre and later, The Royal Ballet where she remains a principal dancer. In that time she has danced some of most iconic roles in the classical ballet canon as well as defining roles in new works by leading choreographers such as Christopher Wheeldon, Wayne McGregor and Alistair Marriott. This September (12 – 16), Natalia will lead a mixed programme of classical and contemporary repertoire on the Sadler’s Wells stage in Pure Dance, alongside esteemed dancers Jonathan Goddard and Jason Kittelberger, and special guest David Hallberg. Natalia made her Royal Ballet debut in 2012 as the leading role of Odette/Odile in Swan Lake, in a dream pairing with the equally revered ballet dancer Carlos Acosta, as Siegfried. They later returned to the Royal Opera House stage to take the leads in Giselle, a role for which Natalia is perhaps best-known. Cuban ballet icon Carlos has also built a successful career as a choreographer, having most recently presented the debut work of his company Acosta Danza, which was produced by Sadler’s Wells and went on to tour the UK and internationally. 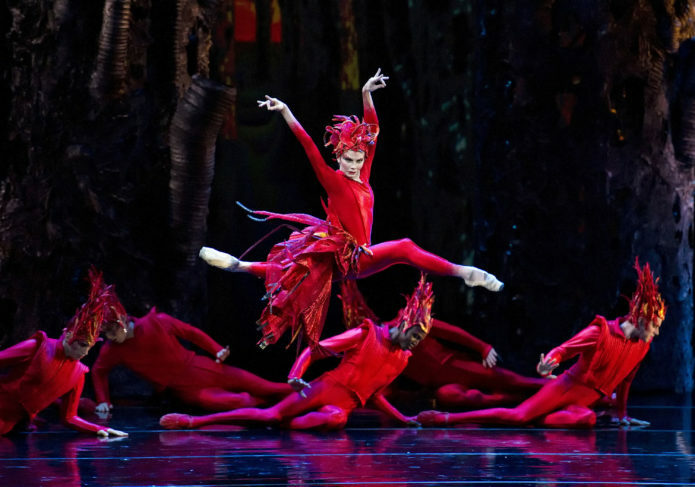 Natalia Osipova as Firebird. Photo: Gene Schiavone/Courtesy American Ballet Theatre. Whilst she was a principal dancer with American Ballet Theatre, Natalia created the title role in the world premiere of The Firebird by renowned choreographer and former director of the Bolshoi Ballet, Alexei Ratmansky. Natalia will perform another world premiere by Ratmansky, Valse Triste, as part of Pure Dance this September, inspired by the music of Finnish composer Jean Sibelius. Natalia and Ratmansky’s longstanding relationship stems back to their days at the Bolshoi, where he spent four years as artistic director. “He amazes me. He comes ready with everything in his mind, and then we start working and he starts changing things. He is very attentive to every little detail, every bend of the finger. 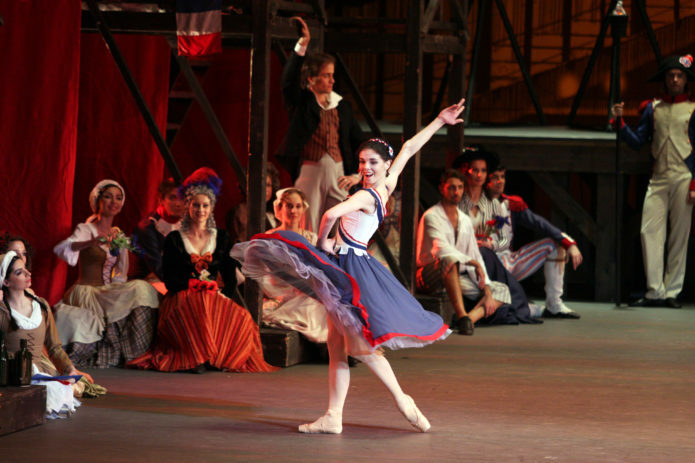 Everything must be done just so,” says Natalia on working with Ratmansky. When Natalia stepped out onto the stage at the London Coliseum in the Bolshoi Ballet’s production of Don Quixote in 2007, the ballet critic for the Financial Times, Clement Crisp, was so blown away that he awarded the show not five, but SIX stars. At just 18 years old, Ivan Vasiliev shone as Basilio alongside Osipova as Kitri in this joyous production. It was her first leading role for the Bolshoi after just one year dancing for the company. In another sensational performance from the Bolshoi Ballet’s golden couple, Natalia and Ivan revived the classic with new choreography by Alexei Ratmansky in 2008 to much critical acclaim, long after it was first performed by the company in 1933. Ivan and Natalia have also experimented with contemporary works, including work by Ohad Naharin, Arthur Pita and Sidi Larbi Cherkaoui in Solo for Two. He is not the only ‘Ivan’ to have worked with Natalia, as she will perform Flutter, a brand new work by the choreographer Iván Pérez as part of Pure Dance! Natalia Osipova and David Hallberg are a match made in ballet heaven, but perhaps their most memorable performance together was in American Ballet Theatre’s production of Giselle. In a lucky accident, Natalia was dancing for ABT at the time when her partner got injured and Hallberg stepped in. Like a romantic fairytale, this fateful accident turned out to be the beginning of a long and successful on stage partnership. And even spookier, they share the same birthday on the 18 May! They will be reunited on-stage once again in Pure Dance, celebrating ten years since they first danced together in Giselle. Hallberg will be performing a brand new solo by director Kim Brandstrup as well as the world premiere of two duets with Natalia, by Ratmansky and Antony Tudor. Pure Dance makes its World Premiere at Sadler’s Wells from 12 – 16 Sep. Tickets are available now priced from £12. To book, call the Ticket Office on 020 7863 8000 or book online.